How can I as a photographer be keeping fit with photography? I know it doesn’t seem to go hand in hand but actually photographing anything can actually be physically strenuous. For example Ipswich School’s sport day last year was a huge challenge. To take dramatic images that portray the sense of speed and motion meant that many images were shot from a low level crouching position (think of me lying down at the end of the long jump). Also running from event to event as track and field were all going on at the same time. Exhausting! I start photographing before the events began and would finish with the final presentation 6 hours later. Muscles were complaining throughout but you overlook that when the adrenalin and creative juices are flowing. I was very happy I had been able to capture pretty much every event. However I was in for a surprise the next morning as I found I couldn’t move. My thigh muscles would scream with every flex and it took three days until I could walk and sit easily again. So a lesson for my next sports photography shoot? Get fit first! Hmmm, I didn’t! 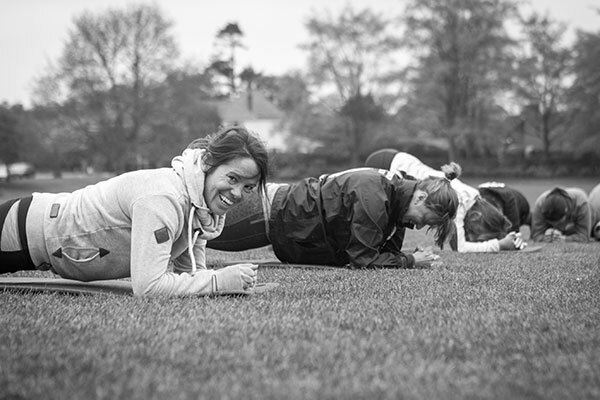 Last month I had the pleasure of photographing two fitness bootcamps. 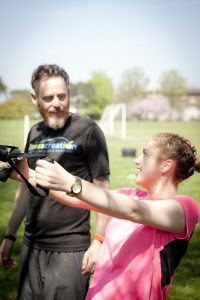 Fitness Creation – a bootcamp for teenage children, based in Ipswich https://www.facebook.com/fitnesscreationltd/ and All About Me – http://itsallaboutmept.co.uk a women’s bootcamp in Woodbridge. Both work at a fast pace and again I found myself in all sorts of positions trying to get the best shot from all angles. I don’t think I could work as hard as the people who took part but I always know a two hour photo shoot with crouching, lying on the floor and constantly having to get up means I am going to feel it the next day. Photographing interiors is no different. In order to get the maximum depth on an image I go as far back into a room with my back generally up against a wall. I like to photograph from a low level or waist high position so can normally be found on the floor in the smallest position and tightest space. I’ll do anything to get “the” photograph. Product photography is never as easy or as straightforward as you think. Setting up for the photograph, styling it, making small tweaks and adjustments to the product or lighting. There is also altering the position of the camera as you go. All of which means a constant movement from sitting or crouching. Then there is the weight of the equipment. The arms get a jolly good workout. The camera lenses I use are glass and heavy. Thank goodness for the monopod and tripod. My favourite camera is the Canon 5D Mk II but it’s heavy in its own right! Adding on the second camera, battery pack up, a Speedlite flash with both camera’s hanging off me it is a constant workout. I need to do some more press ups! In essence there is nothing quite like proper exercise. As I see it professional photographers do get exercise so I don’t feel too bad drinking a glass of wine!